Dr. Dennis Sumara of Brushwood. 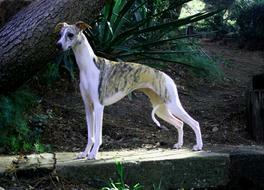 Moxi's second litter is sired by one of the top whippet stud dogs of all time, SBIS Ch Starline's Reign On, JC, ROMX. 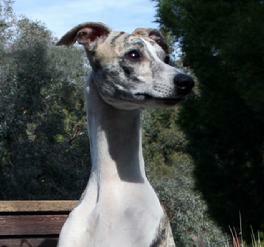 The three males and two females delivered on the collective promise of Reign and Moxi's pedigrees -- they're strikingly marked and shapely whippets with phenomenal sidegaits, expressions and temperaments. Already pointing handily, we feel every pup in this litter of five will shine in the ring. * 118 American Champions. Approx 125 Champions worldwide. 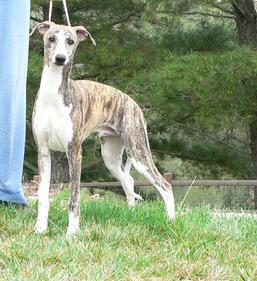 "Teak" - Endeavor's Intrigue at Nysa Hill, wins Puppy Group First at 9 months. Teak growing up at Endeavor. "Spirit" - Nysa Hill Moxi's Soul Endeavor - has a beautifully expressive face and her mother's smooth, flowing lines. "Spirit" -- Nysa Hill Moxi's Soul Endeavor at 15 months. 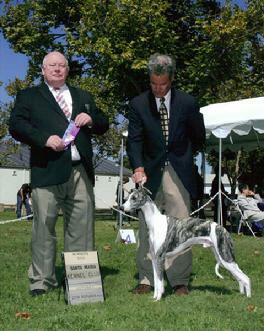 "Jett" - Endeavor's Full Circle at Saxon Shore -- takes Winners Dog under esteemed Hound expert Dr. John Shelton. Moxi daughter Spirit is agile, alert and active by day, with an affectionate and loving nature. 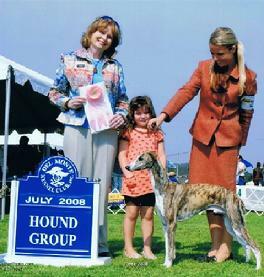 She has won her pup classes with her dam's trademark love of the ring. PAGE IN PROGRESS... MORE PHOTOS TO COME SOON.